Origin Wireless shows off its camera-free detection trick at Computex. Back at CEATEC in October, I came across Origin Wireless and its clever algorithm that can turn any WiFi mesh network into a simple home security plus well-being monitoring system, and that's without using cameras or wearables -- just plug and play. At the time, I saw a working demo that left me impressed, but here at Computex, the company has moved its setup to a real-life environment (a lovely hotel room high up in Taipei), and I was finally able to try its fall detection. 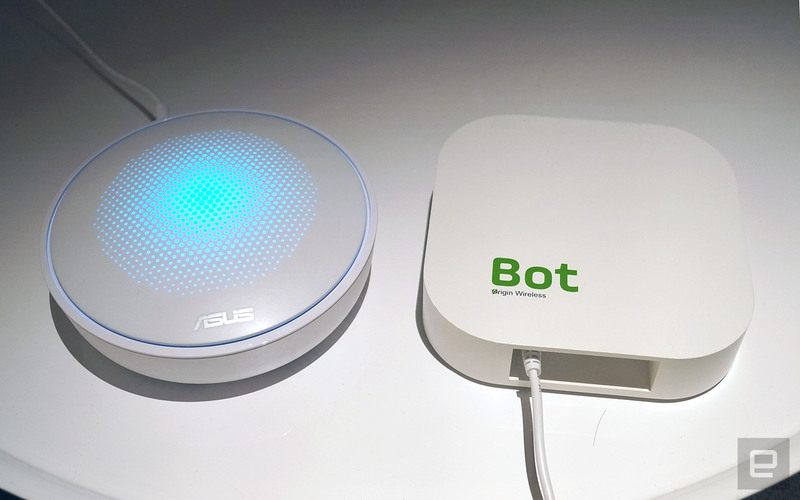 Better yet, it turns out that Origin Wireless has already been working with Qualcomm to integrate its technology into the ASUS Lyra router, meaning we're one step closer to seeing these features outside the lab. Here's a quick primer for those who missed the news the first time around. In a nutshell, Origin Wireless' Time Reversal Machine algorithm relies on the analysis of WiFi multipath signals, as in the unwanted "noise" bounced off the walls. A designated router sends out a probing signal, then another router copies this received signal plus its multipaths and sends it all back but in a backward sequence -- hence "time reversal." All of this is happening 30 times per second -- a slight drop from the original 50Hz speed. Even if you're not quite following this explanation, all you really need to know is that the software is constantly monitoring for changes between the original signals and the returned signals. This can then generate a signature to reflect the type of environmental changes in the space at any instance. The algorithm has already been trained with machine learning to recognize specific changes. 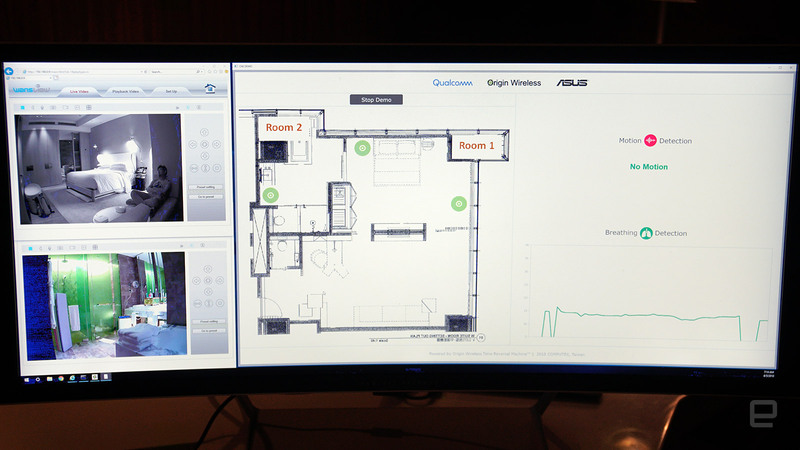 In this demo, I once again got to experience motion and breathing detection using purely WiFi signals, except that Origin Wireless is now using three ASUS Lyra routers instead of its own prototype boxes. No cameras were needed (the live-video feeds on the monitor were just for display purposes), and I also didn't need to put on a wearable device. Most importantly, these don't require a direct line of sight between the routers and the subjects, as is the case with WiFi itself. By combining both motion and breathing detection, this mesh network is able to moonlight as a sleep-quality monitor, which can be handy for looking after elderly folks. Even the motion detection alone can be used for home surveillance, and by using more than two routers in the same network, the system is able to give you a rough estimation of where the motion occurred. What's new this time is the fall-detection demo. Normally, the challenge with fall detection without the use of cameras or wearables is the fact that when someone falls, it all happens in a split second. But since Origin Wireless' solution is scanning for changes 30 times per second, this isn't a problem. Again, with machine learning, the algorithm already knows what kind of signature to expect when someone falls. With the exception of one false reading after I vacated the space, the fall detection worked well for me in both the bedroom and bathroom. That said, this demo was performed with Origin Wireless' own engineering routers, so there's still some work to be done before the feature can be integrated. Still, according to Chairman and COO Jeng-Feng Lee, Origin Wireless' technology may end up on WiFi routers later this year by way of equipment vendors, especially those who serve elderly care centers. As for us younger folks, we may not get to enjoy these features at home until sometime next year, but Lee didn't rule out the possibility of finding a consumer brand that is willing to speed things up a little. After all, this is a purely software-based solution, which can even potentially be added to WiFi mesh routers that you can already buy today.